absorb all the knowledge they contained. As a result, and with the aid of his incredibly well-equipped laboratory (conveniently mounted into the back of an old convertible), he acquired the startling ability to answer any question. In the grand tradition of comic books, he put on a costume (purple-gray tights, red cape and yellow helmet) and adopted the name Answer Man. But instead of performing his super deeds free of charge, like his more altruistic brethren, this superhero made a business of it. In or out of his Answer Man costume (he did not make a secret of his true identity), Genius Jones would answer any question — for ten cents a question (not that kind). Genius Jones's business prospered (there's always a market for a good product at a good price) in the back pages of Adventure Comics (where Starman and The Sandman were the main features), starting in its 77th issue (August, 1942). Many of the questions could be answered only by foiling nefarious (and usually hilarious) criminal plots, so there were plenty of Answer Man action scenes. The character was created by Alfred Bester, making his DC Comics writing debut with the Genius Jones introductory tale. Bester went on to write other DC features (among other things, he is said to have composed one of the two oaths Green Lantern used), but is best known for his Hugo-Award-winning science fiction stories. The artist who first did the series was Stan Kaye, whose other credits include inking both Superman and Batman. 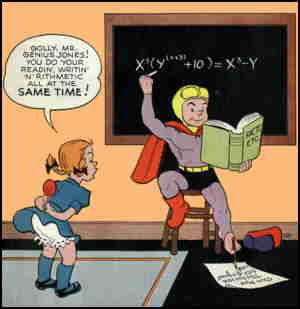 Genius Jones remained in Adventure Comics for more than three years, making only one cover appearance (a tiny inset on #82). The first time he got a whole cover was on the fifth issue of All Funny Comics (Winter, 1944-45). (At least one prominent bibliography, by the way, lists All Funny #1 as Genius Jones's first appearance — actually, Adventure #77 predated it by more than a year.) He was in the first 16 issues of All Funny, but got only one other cover there, that of #7. In 1946, DC re-shuffled a couple of titles, suddenly moving all the superheroes from More Fun Comics into Adventure. Only Genius Jones moved in the other direction. He took up residence in More Fun with its 108th issue (March, 1946), and appeared on a half-dozen covers (alternating with Henry Boltinoff's Dover & Clover) over the next year. In April, 1947, Jimminy & the Magic Book, by Jack Mendelsohn (Jackys Diary) and Howard Post (Strawberry Shortcake), ousted both from the cover. Later that year, More Fun, which had been DC's oldest title, was canceled, and Genius Jones (whose final appearance was in the second-last issue, #126, Sept-Oct 1947) was gone. Like most comic book publishers that go back to the 1940s and beyond, DC has, at various times in the years since, strip-mined its own past. It is almost inconceivable that a DC-owned costumed crime fighter, from the first wave of costumed crime fighters, could fail to have been brought back for an occasional encore appearance decades after his heyday. Even The Terrific Whatzit, a super-powered turtle who starred in mid-'40s Funny Stuff, made a guest appearance with Captain Carrot in 1982.
the ones that had a brief moment in the sun in All Funny Comics and the waning years of More Fun, just before comics passed them by. Most remain passed by, but Genius Jones unexpectedly turned up in 2007. With him were Anthro, J.E.B. Stewart's ghost and other defunct DC characters more obscure yet. Maybe there's hope yet for Penniless Palmer and Two-Gun Percy. Text ©2000-10 Donald D. Markstein. Art © DC Comics.